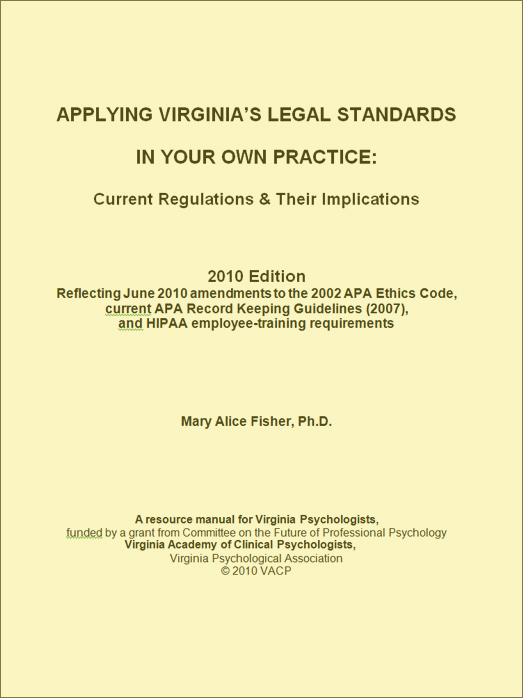 Containing: Discussion of Board of Psychology Standards of Practice, 2010 amendments to the American Psychological Association Ethics Code, references to current Virginia statutes as of July 2010, and legal information on HIPAA requirements for training employees about privacy/confidentiality. Made available by the Committee on the Future of Professional Psychology of the Virginia Academy of Clinical Psychologists (VACP) through a grant to Mary Alice Fisher, Ph.D. This manual is offered at reduced cost to VACP members, as a member benefit. at www.vapsych.org or 804-643-5614 or by using This Order Form.